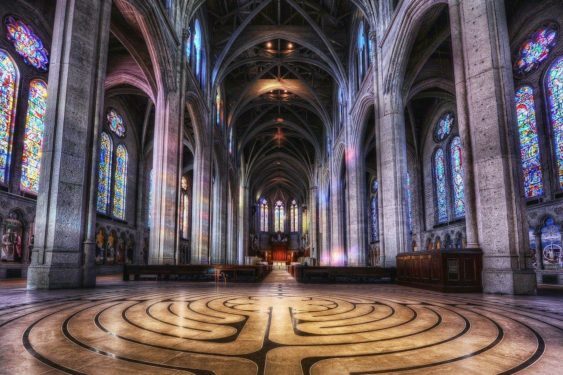 One evening a month (usually the second Friday, but not always), Grace Cathedral invites you to walk the labyrinth by candlelight and music and pray for peace in our hearts and peace in the world. The walk is hosted by the Labyrinth Guild. Always check the Labyrinth website for the latest updates and to confirm the date. Each month they feature a different musician and offer an introduction to the labyrinth. This event is open to all who have an interest in the labyrinth or just wish to experience the Cathedral in a way that is seldom possible. Walking the Labyrinths at Grace Cathedral The labyrinth is an archetype, a divine imprint, found in all religious traditions in various forms around the world. By walking a replica of the Chartres labyrinth, laid in the floor of Chartres Cathedral in France around 1220, we are rediscovering a long-forgotten mystical tradition. The labyrinth has only one path so there are no tricks to it and no dead ends. The path winds throughout and becomes a mirror for where we are in our lives. It touches our sorrows and releases our joys. Walk it with an open mind and an open heart. Guidelines for the walk Quiet your mind and become aware of your breath. Allow yourself to find the pace your body wants to go. The path is two ways. Those going in will meet those coming out. You may “pass” people or let others step around you. Do what feels natural.